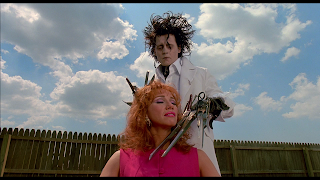 A dark fantasy drama with a mean streak of humour, Edward Scissorhands is a fiercely original treatment of the comfortably familiar fitting-in theme. The film is set in a suburban subdivision located at the base of a mountain, with a Gothic mansion on top looming over the quaint houses. On a snowy night, an old lady tucks her granddaughter in and recounts a story that happened years ago, triggering a film-long flashback. Avon lady Peg (Dianne Wiest), a subdivision resident, is having a bad day, and with nothing to lose decides to head up to the mansion to try and make a sale. 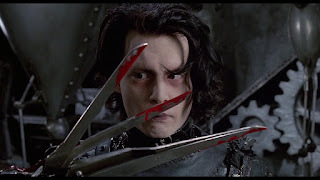 Inside she finds the place empty except for a frightened young man called Edward (Johnny Depp), with large scissors for hands. Edward was created by The Inventor (Vincent Price), who died before he could complete Edward and provide him with proper hands. Peg feels sorry for Edward and takes him home. Peg's husband Bill (Alan Arkin) and son Kevin are initially stunned but accept Edward as a new member of the family. Edward is scared and his massive scissor hands cause plenty of accidents, but with Peg's help he slowly starts to adapt to suburban life. The gossipy neighbours, including the over-sexed Joyce (Kathy Baker), are fascinated, and Edward becomes a local celebrity when he demonstrates artistic talent for sculptural hedges, trimming the fur of pet dogs, and providing the women with stylish hair cuts. When Peg's daughter Kim (Winona Ryder) returns from a camping trip, she is initially horrified to find Edward in her room, but gradually Kim and Edward develop feelings for each other, which is bad news for Kim's aggressive boyfriend Jim (Anthony Michael Hall). Directed and co-produced by Tim Burton and written by Caroline Thompson, Edward Scissorhands is a dark masterpiece. With brisk pacing Burton unleashes his irresistible fantasy on a comically idealized suburban world stuck in an undefined hybrid of the 1950s and 1970s, with every house sporting a bright monochrome paint job. The mansion on the hill, of course, stands in stark contrast, the brooding outsider bathed in black, dark blues and darker greys. Peg and her neighbours go about their business of pursuing the American dream, the women left at home during the day to gossip and cause mischief while the men drive to work in the morning and come back in the evening with army-like discipline. Edward is dropped into this immaculately manicured world, and his dream is just to be part of the human family. Not too tall and definitely not superficially handsome, Edward is pasty but enigmatic. Remarkably, he is generally accepted as is, and only the complications caused by affairs of the heart cause him grief. The central themes of belonging, finding a home, and stumbling upon love run through the film. Once Kim makes her appearance the candle of romance flickers to life, but the darkness also seeps in, with Edward causing unintended grief by wanting to love and be loved. The film suggests that the ability to care and love is fundamentally human, and a non-human invention such as Edward can live alongside humans but will struggle to share in the true fulfillment brought upon by mutual passion. Burton makes use of plenty of clever point-of-view shots, particularly from Edward's perspective, to highlight the experience of the newcomer with an incomplete skill set. Whether it's Peg being excessively nice with her make-up kit or Edward trying to capture any vegetable to eat at dinner, Burton frequently invites the viewer to live in Edward's shoes, dramatically enhancing the film's impact even in the smallest moments daily life. Johnny Depp launched his career with his portrayal of Edward. It's an unforgettable performance centred on almost silent pathos. Depp's understated expressions convey sadness, fear, panic, bewilderment, anger and sometimes happiness, and later on he captures what it means to find wistful infatuation and a potential first romance. Wiest represents middle America's capacity to display a big and welcoming heart, while Ryder does well in a quick transition from callous to caring. Kathy Baker plays neighbour Joyce for broad laughs, as intended. Edward Scissorhands delivers on all its multi-genre promises, mixing drama, humour, fantasy and romance with an emotionally satisfying cutting edge.